It's that time of year again and while I've been going back and forth on the idea, I decided I would go ahead and make a birthday cake anyway. And it's been a long, long time since I've made a Brunsviger, so here goes. Last year I made a Danish Layer Cake cause I could and while it was very good, I wanted something a little different this time. Now for the Brunsviger. When I was little Mom would make this for my sister and myself, and sometimes she'd make it in the shape of a Kagemand/kone (cakeman or woman), and the topping would run over the sides and make wonderful little toffee puddles and they were so good. And it would generally make a mess in the oven as well. But, hey, when you're a kid, who cares. All I cared about was getting the topping, giggle. Here's how it's saved in my personal cookbook. The Danish is to the left and the English translation to the right. This is the recipe my mom used and I use. The basic recipe is the same no matter where you look. A light yeast dough, with a sugar butter topping, basically yummy. The printable recipe is at the end of this post. Margarine hakkes I mel, aeggene tilsaettes sammen med sukkeret, gaeren smuldres I dejen ell oplose I lidt af den lunkne maelk, og dejen samles med resten a maelken, Dejen aeltes godt, rulles ud till en store plade, der skoeres ud til en stor kagemand eller kone, some laeges pa en smurt plade. Kanelmassen rores sammen, smores over dejen, og haever lunt I 20-25 minutter, bager ved god varme 225 deg, I 20 minutter. ***Now for my notes on this. I find that when I make this dough, it's too soft to roll out, so I spread it into the pan. I use my mixmaster to knead the dough. And depending on the humidity and how your flour is I would recommend you sift the flour first. I actually made two batches the other day, since I was going to do my cooking stint at the Senior's center I took most of it in there with me. Just left myself a couple of pieces. This does dry out real fast, so I would recommend eating right away, but the occasional piece heated up for breakfast is good as well. And if you have a kitchen scale, use that. I have one and use it all the time especially when I'm baking something from my Danish cookbooks. I just put a piece of plastic wrap in the tray and that way I don't have to wash it in between ingredients. (that's the purple thing you see). And I've said before that if I screw up, I'll you know. And it's with a red face, sorta, that I have to admit to making the first Brunsviger, and forgetting the eggs. Oops. I was sailing along, taking pictures of the process, having a great time doing so. Got the Brunsviger out of the oven, made a fresh pot of coffee, set my cup and a slice or two of Brunsviger on the table, and took a bite. Then I took some pictures. Now the cake was awfully light, but I thought that was because I'd run out of flour and had to substitute a half cup of self rising flour, but it tasted good. So I took my pictures, finished off the cake, turned around and there were two eggs sitting on the counter. I had totally missed putting them into the batter. But you know what, it still tasted good. So I made a second batch after I'd been to the store and gotten more flour, and the second one tasted great as well. I made sure there were eggs in that batch. The only real difference between the two was that the crumb on the first one was extremely tender, and a little crumbly. I still have some Brunsviger left, but I'm going to turn that into a miniature bread pudding. I think it will work out real well, and in fact I'll let you know how it turns out. This is a traditional birthday cake for children in Denmark. 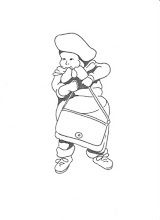 The dough is made in the shape of a 'Kagemand' Cakeman or 'Kagekrone' Cake woman. It's decorated a little with frosting outlining the shapes and with candies sprinkled on top. Personally, I don't do that, I just eat it with as an accompaniment to my coffee. Cut butter into the flour, and add egg along with the sugar. Soften yeast in a little of the lukewarm milk, and add to the dough with the rest of the milk. Knead dough well and roll out into a large sheet and cut it into either a cakeman or cake woman and place on large greased cookie sheet. Mix cinnamon mixture together and spread over the dough. Place in warm place to rise for about 20-25 minutes, bake for about 20-25 minutes in a 325 degree oven. Or place dough in a large pan, spread cinnamon mixture over it and then using the end of a wooden spoon poke holes down into the dough and let rise for the 20 minutes or so and then bake for 20-25 minutes in 325 deg. oven. Serve warm or cool. Although this is best warm. In fact fresh out of the oven is best. ***Now for my notes on this. I find that when I make this dough, it's too soft to roll out, so I spread it out into the pan with my hands. I use my mixmaster to knead the dough. And depending on the humidity and how your flour is I would recommend you sift the flour first. (Danish instructions) Margarine hakkes I mel, aeggene tilsaettes sammen med sukkeret, gaeren smuldres I dejen ell oplose I lidt af den lunkne maelk, og dejen samles med resten a maelken, Dejen aeltes godt, rulles ud till en store plade, der skoeres ud til en stor kagemand eller kone, some laeges pa en smurt plade. Kanelmassen rores sammen, smores over dejen, og haever lunt I 20-25 minutter, bager ved god varme 225 deg, I 20 minutter. Hygge - Danish Food and Recipes would be a great gift for yourself or any foodies in your life. Available as a Kindle e book or in paperback. Autographed copies are also available at the Danish Windmill in Elk Horn, Iowa or on their website. 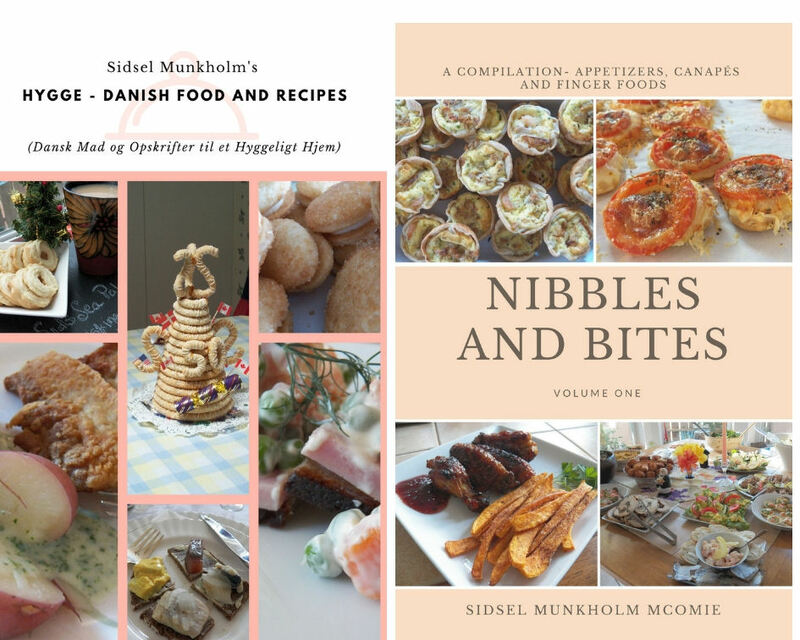 Nibbles and Bites which is a collection of Appetizers is also now available on Amazon, in paperback or as a Kindle ebook. All recipes and their respective images are either original or adapted and credited, and are all the sole property of Sid's Sea Palm Cooking © 2011-2018, with all rights reserved thereof. Lol that is so funny about the eggs. I know what you mean though because I've made chicken noodle soup...without the chicken. I had to hear about that one for a long time. The Brunsviger looks fantastic and Happy belated Birthday! I thought it was funny, but then again, I'm kinda strange that way. The cake tasted pretty good though, surprisingly so. But chicken soup without the chicken, that's a good one. But I bet you had a lovely vegetable broth. And thanks for the birthday wishes.